A female skeleton shrimp sways spookily with the ocean current. This Halloween, we’d like to introduce you to one of the most bizarre groups of crustaceans in Puget Sound – the skeleton shrimp. From their spindly skeletal bodies to their creepy waving movements, these otherworldly critters are bound to make your skin crawl! If you can put aside their alien appearance, skeleton shrimp are fascinating creatures. Unlike most of their cousins in the order Amphipoda (which actually do resemble tiny shrimp), the skeleton shrimps (or “caprellids”) are specialized for clinging rather than swimming in marine habitats. If they want to move, they have to crawl along like inchworms. They also have adaptations for camouflage, changing colors to blend in with their surroundings. You can find them hiding among other invertebrate critters on docks and pilings, using their hook-like back legs to hang on to the plant-like fronds of colonial hydroids and bryozoans. They can also be found in beds of seaweed and eelgrass, their lanky bodies waving about in the water current. Center: A female Tritella pilimana broods her eggs in a special pouch. Image courtesy of Dave Cowles, wallawalla.edu. Skeleton shrimp have varied feeding methods – some species are filter feeders that wait for food to come to them, while others are predators, hunting for worms and crustacean larvae. Some eat detritus (dead particulate material), and some species like to munch on tiny microalgae called diatoms. In fact, skeleton shrimp are so good at grazing on diatoms that their presence is thought to keep eelgrass beds healthier by removing diatoms that encrust the blades. Fish and larger invertebrates pass these nutrients up to the higher trophic levels when they eat the skeleton shrimp. 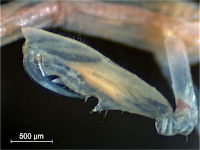 The male gnathopod of Caprella cf californica. A skeleton shrimp’s unusually large claws, called gnathopods, play an important role in their mating behavior. In some species (including species of Caprella found in Puget Sound), the male’s gnathopods are armed with a poison-producing gland. The toxins they make aren’t harmful to humans, but when two males fight over a mate, the outcome can be deadly. Mating can be tricky for these critters because their window of opportunity is short. Like all arthropods, they shed their exoskeletons to grow in a process called molting. The female is only able to mate right after molting, when her new exoskeleton is still soft. She carries her eggs in special flaps called brood pouches, and the young hatch out looking just like miniature adults, immediately inching away to find their own little branches to attach to. For taxonomists, the scariest thing about skeleton shrimp is identifying them! We encounter over half a dozen species in Puget Sound, and telling them apart can be quite the daunting task. We look for key features such as the length of the antennae, whether or not the animal has a spine on its head, and the shape of its gnathopods. Despite the taxonomic challenges, we do enjoy seeing these weird little beasts in our samples, although the swaying and claw-waving of the live ones can be a bit unnerving. So if you really want to get spooked on Halloween, head down to a dock, peer into the murky water, and hunt for tiny skeletons! 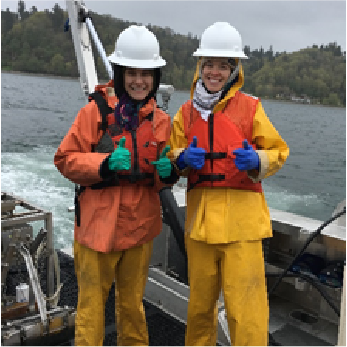 Our benthic taxonomists, Dany and Angela, identify and count sediment-dwelling organisms as part of the Marine Sediment Monitoring Program. They track the numbers and types of species they see in order to understand the health of Puget Sound and detect changes over time. Dany and Angela share their discoveries by bringing us a benthic Critter of the Month. These posts will give you a peek into the life of Puget Sound’s least known inhabitants. Can't get enough benthos? See photos from our Eyes Under Puget Sound collection on Flickr.